Police are seeking public assistance in identifying the person responsible for the shooting death of Djamal Atroune at Lay's Shell Station on the morning of Dec. 5. 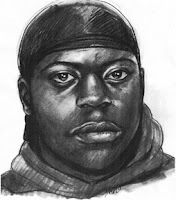 The subject is described as a black male between 5'7" and 5'10" in height of a medium to heavyset build. This is the forensic artistic sketch based on this event. This suspect is also thought to be the same person responsible for the robbery occurring shortly thereafter at the Kangaroo station on Prince Avenue. These are two still images from a security camera. Anyone with information should call Det. Chuck Ivey with the Athens-Clarke County Police at (706) 613-3888 ext. 337 or Special Agent Rebecca Shaw with the Georgia Bureau of Investigation at (800) 597-8477. Crime Stoppers is offering a $2,000 reward for information leading to the arrest and conviction of this subject.